AUSTIN, Texas - July 6, 2017 - FloSports, the innovator in live digital sports and original content, today announced its next sport will be football. The brand, which delivers exclusive live events and in-depth coverage of largely underserved sports ranging from jiu-jitsu to gymnastics, launches FloFootball to continue its expansion into mainstream sports. The FloSports network already includes FloHoops and FloCombat, which provide comprehensive coverage of basketball and mixed martial arts, respectively.provide comprehensive coverage of basketball and mixed martial arts, respectively. FloFootball launches with rights deals secured with The Spring League, USA Football and some of the top high school football programs in the U.S.
On July 15 in Napa, Calif., FloFootball will air The Spring League Showcase, which comes on the heels of The Spring League's successful April 2017 season. Each competing team is comprised of former and future NFL players and Division I college football stars, who are vying to secure a roster spot on an NFL team heading into 2017 training camp. More than 90 players have committed to The Spring League Showcase, including former 49ers running back Anthony Dixon, former Carolina Panthers defensive end Greg Hardy and former Buffalo Bills running back Fred Jackson. "Today's announcement illustrates our commitment to building and maintaining the world's leading direct-to-consumer experience for all sports fans," FloSports co-founder and CEO Martin Floreani said. "Football is arguably the most popular sport in the country, but it lacks consistent and comprehensive live coverage across all levels of the sport, and we believe our model can fill this gap." "FloSports will provide The Spring League with the ideal direct-to-consumer platform to live stream our Showcase game to a global fan base," The Spring League CEO Brian Woods said. 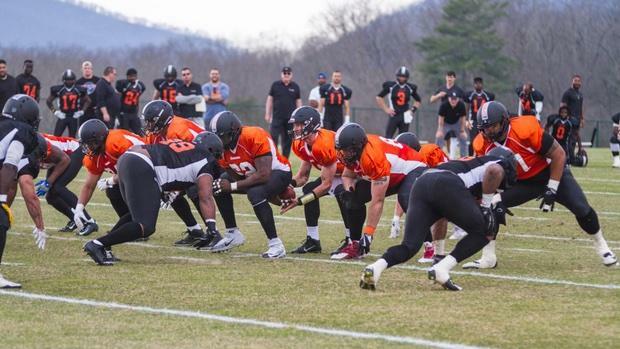 "We're excited to build off the success from our inaugural season in April and provide an additional opportunity for free agents ahead of NFL training camps." FloFootball also has live coverage of two tournaments from USA Football's 7-on-7 National Championship Series tournaments in July, each showcasing top talent within high school football from across the U.S. FloSports will air the tournaments from Hoover, Ala., and Canton, Ohio, on FloFootball.com. "We are pleased to partner with FloSports to live stream USA Football's 7on7 National Championship Series events," said Brandon Sheppard, USA Football director of 7on7. "Our events offer high-quality competition for high school programs throughout the country, and through FloSports' innovative approach to live coverage, we can share the fun and excitement of these competitions to a greater audience." To access live coverage of The Spring League Showcase and the other events, visit FloFootball.com and become a monthly or annual FloPRO subscriber. Annual subscribers unlock access to premium content across the entire FloSports network. The Spring League was created in early 2016 to serve as an instructional league and developmental platform for professional football talent. With a current membership of four teams, the league conducts joint practices and games, played in accordance with NFL rules, during the month of April. The Spring League also functions as a scouting event for NFL and CFL teams. During the 2017 season, 10 NFL teams, along with two CFL teams, attended both practices and games to evaluate talent. USA Football designs and delivers premier educational, developmental and competitive programs to advance and grow the sport. As the sport's national governing body, a member of the U.S. Olympic Committee and organizer of the U.S. National Team for international competition, USA Football partners with leaders in medicine, child advocacy and athletics to support positive football experiences for youth, high school and other amateur players.